Most Farmer’s Fridge selections other than some sandwiches are packed in attractive jars, such as these salads. The idea of conveniently accessed fresh, wholesome meals has been growing as technology and logistics solutions improve. From micromarkets to high-tech automated merchandising units, vendors and operators are finding ways to deliver the kinds of high-quality products customers—especially younger ones—demand in ways that are convenient, flexible and financially sustainable. 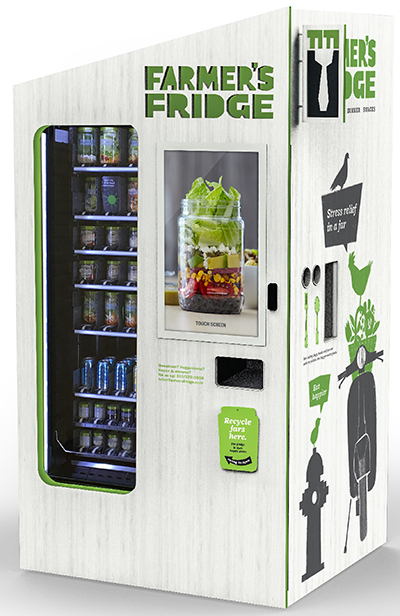 One of the latest entries to this field is Farmer’s Fridge, which now operates more than a hundred of its unmanned fresh food vending units across the Chicago and Milwaukee metro regions. Locations include the University of Wisconsin-Milwaukee, the University of Illinois-Chicago, DePaul University, Rush Medical Center, Northwestern Medicine, Loyola Medical Center, the Allstate HQ in Northbrook, the Walgreens Corporate Office in Deerfield, the Wrigley Building, McCormick Place, and both O’Hare and Midway Airports. Farmer’s Fridge units adapt to multiple types of venues to offer fresh food options with vending-style convenience. Farmer’s Fridge units are maintained by the company, which monitors and restocks them daily, with any unsold product donated to community members in need. The selections include salads such as smoked cheddar Cobb, sandwiches like tarragon chicken salad and caprese, bowl meals featuring noodle and grain bases, animal and vegetable proteins like garlic lemon shrimp and falafel, and snacks like energy bars, nut mixes, and veggies and hummus. Everything is scratch-made using seasonal ingredients from local partners whenever possible. At NorthShore University Health System, each of the network’s four hospitals has a Farmer’s Fridge unit, generally in the vending area, where they can be accessed around the clock. “The idea is to provide healthier options to our employees, during the day but primarily at night when we don’t [otherwise] have those fresher offerings for them,” says Michael Fiore, senior director of environmental health and safety and clinical operations for NorthShore. The units sell salads and proteins to complement the more standard snack-type options in the traditional vending machines. It fills a need for providing such more nutritious fare in accordance with the health system’s mission to promote healthier lifestyles, Fiore says. The units are administered through NorthShore’s vending contract, which suggested them as a fresh, healthy complement to the choices in the more traditional vending machines. 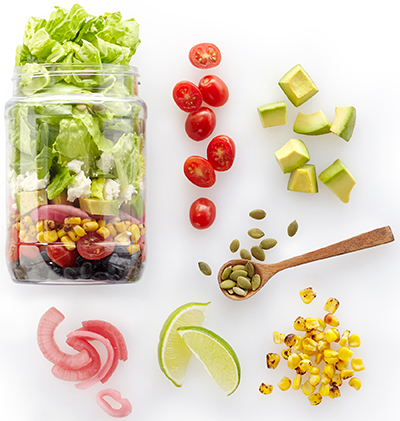 The Southwest salad has hand-chopped romaine lettuce with black beans, fire-roasted corn, avocado and grape tomatoes topped with housemade pickled red onions, feta, pepitas and a tangy housemade avocado-lime dressing. The University of Wisconsin-Milwaukee currently has five Farmer’s Fridge units and is considering two more. It started with three last fall, then added two more when they were found to be quite popular. The current units are in academic buildings, the library, the student union and an athletic center near the parking area, though one of the proposed additions may even end up in a residence hall, says Chad Boppel, assistant director of operational support for UW-Milwaukee Restaurant Operations/Retail Services. The product mix consists of all fresh-made selections like salads and healthy snacks like trail mix. As the first units weren’t installed until late in October, they mostly missed the two traditionally highest revenue months of the school year, Boppel observes, as the holidays and the mid-year semester break interrupt the subsequent months until the spring, by which time on-campus student spending tends to dilute. Nevertheless, he is encouraged by sales figures for February, a full academic month in which the Farmer’s Fridge in the student union did around $2,500 in sales and the two other machines operational over the whole month did around $1,500 each. “I’m sure September and October next year will be a lot higher than that,” he says, adding that by that point the machines will be able to accept student meal cards (currently they only take commercial credit and debit cards). At NorthShore, sales spikes seem to occur not just in the evening after the cafeteria shuts down but also in mid-morning when, Fiore theorizes, a morning crew comes in and “grabs their salads in anticipation for lunch,” even though the cafeteria is open and operating. The additional meal outlet offers a number of benefits, he says.